What the rep said: An all-mountain board. 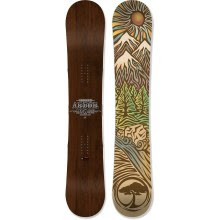 This board has the Mountain System: parabolic rocker (more rocker between the inserts, less rocker outside of 'em), grip tech (a sidecut that adds contact points underfoot) and other stuff that made my mind wander to the mountain. Also, this board is similar to the Arbor Coda, but a little softer flexing. Finally, the Cascade has base graphics done by contest winner Dan Burns and it's only available at REI. Stats/Setup: I'm checking in around 6'1" and 165# wearing size 10.5, 32 Focus Boa boots inside Union Force SL bindings. I rode the board (a 161) at a demo day at Mt. Hood Meadows. The Ride: This is my first experience with full-length rocker and the first thing I noticed was the instant press-ability. This stick lets you get waaaay back. As a consequence, it's less poppy and the pop engages later. Once I adjusted to the rocker, I found this lively board at home with its fellow trees. With full-length rocker and some extra length on the nose, it should do well in powder. I didn't get a chance to dive into anything substantial, but it did fine in the few inches we had. Rockered boards can get a little squirrelly underfoot and the Cascade is no exception. A nice longitudinal flex pattern kept this to a minimum while preserving turn initiation. Another sacrifice was stability at speed, which kept me from testing many high-speed turns. The one flat-out, toe-side turn I arced felt like riding a mechanical bull. The Grip Tech sidecut holds through short- and mid-radius turns and engages subtly without grabbing. I liked it better than a radial sidecut, but the runs weren't icy, either. Bottom Line: Fun to butter and cruise around with. It might be an all-mountain board, if you live in the Mid-West. Otherwise you'd want to look for something a bit more damp that could handle speed better. The reps said that's it's bro, the Arbor Coda.